Beluga is a caviar extracted from the Huso Huso sturgeon. A fish that can reach 8 meters (26 ft) in length and more than 1.5 tons (3300 lbs) in weight. Originally found in the Black Sea, Caspian Sea, Azov Sea, it was also present in Italy in the Adriatic Sea, Ionian Sea and their tributaries before its extinction. Its quality is the most rare and expensive, defined by large roe (more than 3 mm), oval shape and color tones of pearl to dark grey. 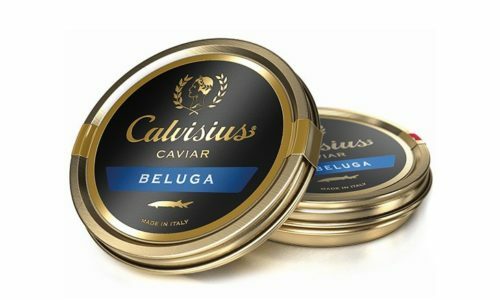 Tradition is a caviar extracted from the White Sturgeon, a native species of the North American West coast, from Alaska to Southern California. It is one of the longest-living sturgeons, reaching up to one hundred years of age. It weighs 1760 lbs (800 kg) and can be as long as 19ft (6 m). High in protein, this lean fish is particularly refined and so is its exquisite large roe ranging from 3.0 to 3.2 mm in diameter and varying between dark grey to black in color. Siberian caviar is extracted from the Siberian sturgeon. A medium-sized fish with a weight between 8 and 40 kg (17.6 to 88.2 lbs), originally found in the fluvial basins of Siberia and Lake Baikal. This caviar boasts a strong character and is very versatile in the kitchen. The size of the egg differs with the age of the sturgeon (from 2.5 to 3mm) and its color ranges from grey to amber. It pairs nicely with potatoes, sour cream, crème fraiche, soft bread or with blinis.